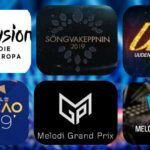 This afternoon RTP held in its studios the draw allocation for the semi finals of Festival da Canção 2019 , the format through which the country determines its Eurovision representative. The 16 composers were selected via three different procedures. 14 of them were selected directly by national broadcaster RTP. One song was chosen through the radio program “Master Class” on radio Antena 1, via the public submissions process. In 2018 Portugal hosted the contest and was represented in home soil by Cláudia Pascoal and the entry O Jardim which unfortunately finish in the last place of the final.